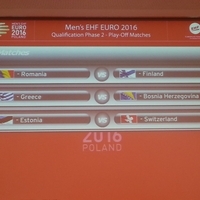 For the first time three play-off matches as part of the qualification for the Men's EHF EURO 2016 were drawn on Thursday, 27 June, at the EHF Office in Vienna. Finland, Greece and Estonia had reached this stage as the respective group winners of the first qualification phase for the final tournament in Poland. Switzerland, Bosnia-Herzegovina and Romania have to play these matches because they have been the three lowest ranked teams from the second qualification phase for the EHF EURO 2014 in Denmark. The first mentioned team has the home right in the first leg. The first leg will be played on 2/3 April 2014, the second leg on 5/6 April 2014. The winners of the play-off matches will qualify for the Men's EHF EURO 2014 Qualification Phase 2 for which round 1 will throw off on 29 October 2014. The final tournament in Poland will take place from 17 to 31 January 2016.